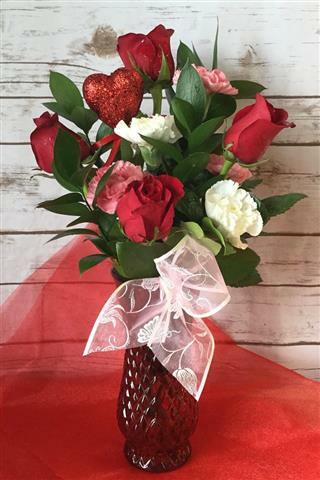 A romantic mixture of roses and carnations in a red glass vase with assorted greenery and accented with a heart floral pick and ribbon. UPGRADE: ADDS 1 MORE ROSE AND A TOUCH OF BABIES BREATH FOR $10.00 PLUS TAX MORE. Please visit our REQUEST AN ORDER page to choose pick-up or delivery for your order.